HMD has launched a number of new devices at MWC, in Barcelona. The company introduced the Nokia 1, Nokia 7 Plus and Nokia 8 Sirocco at the event, the latter two of which have been in the headlines. The Nokia 1 has been a lot more subdued, however, and rightfully so, as it offers an overall package that will likely doesn't appeal to the average person. The company released the Nokia 2 a few months to just about no fanfare. The Nokia 2 was an extreme budget device in its right, as it packed minimal specifications for a smartphone, with a Snapdragon 212, 1 GB of RAM, and 8 GB of storage—specs one would expect from a 2014 budget device, basically. Going by Nokia's naming scheme, we always expected the Nokia 1 to go even further down the budget hole, but by how much exactly was the question. The Nokia 1 does just that, and splendidly to boot. Like the Nokia 2, it features just the 1 GB of RAM, and 8 GB of storage. It also opts for a 4.5-inch 480x854 display, which is, surely, as low as display resolutions can go at that size without content being rendered as scribbles reminiscent of doctor prescriptions from the early 20th-century. Unlike the Nokia 2 that utilizes a Snapdragon 212, the Nokia 1 opts for MediaTek's MT6737M budget SoC. 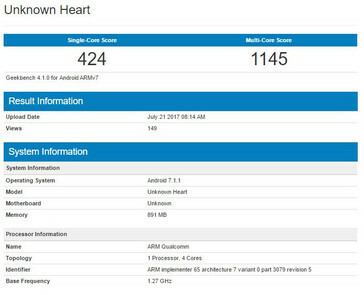 Quite amusingly, the MT6737M outperforms the Snapdragon 212 in both single core and multi-core tests. MediaTek SoCs come with their own bag of issues, though, and we're not exactly sure how viable software updates will be for the Nokia 1. The Nokia 3, another HMD device to feature a MediaTek SoC, has already had its issues with updates. Speaking of software, the Nokia was released under the umbrella of Google's new Android Go program. The program is designed to grant low-end devices the gift of a stripped-down, compressed version of stock Android Oreo. That, coupled with the slightly more powerful SoC, actually ensures that the Nokia 1 will likely run better than the Nokia 2. Pretty impressive, considering the fact that the Nokia 2 costs $100, while the Nokia 1 goes for just $85. The Nokia 1 features a single 5 MP rear camera. Of course, you won't be able to take professional shots with that—or even shots you'll want to view on a larger display—but hey, the phone costs just $85; it's a bit hard to complain. So, how does the Nokia 1 compare to similar devices in that price bracket? There's the ZTE Tempo Go, another Android Go device launched at MWC. The Tempo Go shares a number of specifications with the Nokia 1, but has an even weaker SoC—the Snapdragon 210. It does, however, have a sleeker frame, better design, and is slightly cheaper at US$80. Another major competitor is the Redmi 5A. Xiaomi are undisputed kings of the budget market, and the company also offers impeccable price to performance ratios on devices in all price segments. That considered, it's no surprise that the Redmi 5A absolutely smokes the Nokia 1 in terms of value for money. 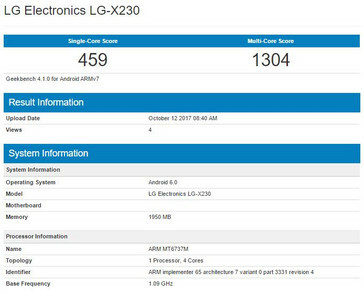 The device features a 5-inch HD display, with 2 GB of RAM, 16 GB of storage, a 13 MP rear camera, a 3000 mAh battery, and a Snapdragon 425. It isn't that much expensive, either, as it goes for $90 on Aliexpress. Of course, it doesn't come with the perk of stock Android Oreo—it's saddled with the Xiaomi's MIUI skin. While the Redmi 5A offers better value for money, the Nokia 1 also does a good enough job, good enough that it looks like an excellent offering—in its segment—by HMD. 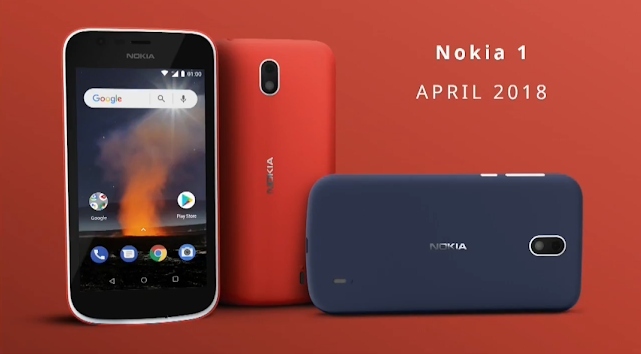 The company has come a long way since it released its first device about a year, and that is sure to bring smiles on the faces of lovers of the age-old Nokia brand. The Nokia 1 will go on sale in April, so you may want to start saving up for it now.